The Wall That Heals honors the more than three million Americans who served in the U.S. armed forces during the Vietnam War, and its walls bear the names of the more than 58,000 men and women who made the ultimate sacrifice. It is a replica of the Vietnam Veterans Memorial wall in Washington, D.C. 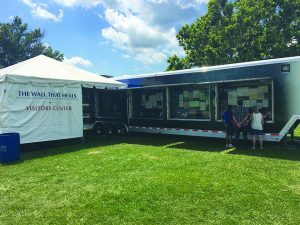 The Vietnam Veterans Memorial Fund, the organization that built the D.C. memorial, created the mobile exhibit to give all veterans and their family members an opportunity to see the memorial. The replica wall is erected in a chevron shape like the original monument. The replica is made of powder-coated aluminum, supported by an aluminum frame, and is made up of 24 individual panels, each containing six columns of names that replicate the names on the original wall and are listed alphabetically by day of casualty. Since its debut in 1996, more than two million people have visited The Wall That Heals sites during stops in nearly 400 U.S. communities, the Four Provinces of Ireland in 1999 and Canada in 2005.